I love this time of the year because every time I walk out into our backyard, I am overwhelmed with the amazing aromas in the air from our lilacs and blooming fruit trees. It absolutely smells like there is a perfume in the air! We were blessed to acquire 9 enormous lilac bushes when we purchased our property 4 years ago. Accordingly, I have been doing lots of research on how to care for them. So, today, I am going to share with you some suggestions about Pruning and Enjoying Lilacs and how to keep them flourishing. Mother’s Day was yesterday, so I made this for our living room from cuttings from three of my bushes. I like mixing the different varieties we have to add a little more interest! I am sitting here looking at them now as I write this post. You should smell how lovely it is in here! Most of our lilac bushes are well over 12-15 tall, so it is quite a bit to maintain. They were primarily left unkept prior to us taking over the yard so I have been nursing a few back to a better life. In one case, it meant cutting it all the way back to the ground…a really sad day here for sure! This year, I am working on scaling some of them back. Lilacs do really well here in Colorado. Not sure why, but they do! I just love enjoying their blooms both outside and inside. It does pain me, however, to cut them to enjoy them inside. I just choose from parts of the bush that I intend to cut back after they bloom. Pruning a lilac bush is not like other bushes. The best time to prune them is right after the blooms have withered. Most people are not aware of this. Lilac stems set their next season’s flower buds almost immediately, so pruning too late will mean sacrificing next year’s blooms. Brand new bushes do not require maintenance pruning until they are around 6 -8 feet tall, so they are pretty low maintenance overall up until they need to be controlled. For first time maintenance and pruning, you should start with cutting back the ends of the stems that just flowered (deadheading). Next, cut out any dead or diseased stems. If you are interested in maintaining a certain height or shape, you can cut back the stems that are growing beyond your desired size by going to down the stem to the length that you want it. Once located, cut it back about 1/4″ above a spot on the stem just above where there are at least two new shoots growing. Always cut the stems at an angle. This is much healthier for the bush. I am in the process of doing this with several of my bushes. Based on the height of mine, some of them are over 25 years old. Our house was built in 1972, so that is certainly possible. It is a bit painful if you take the more drastic route, but the outcome should be worth it in a couple of years. The less drastic approach to getting an overgrown lilac back into shape is to use the 1/3 rule of thumb. Prune 1/3 of the oldest branches each year, all the way to the ground. Start by taking out the thickest stems first. 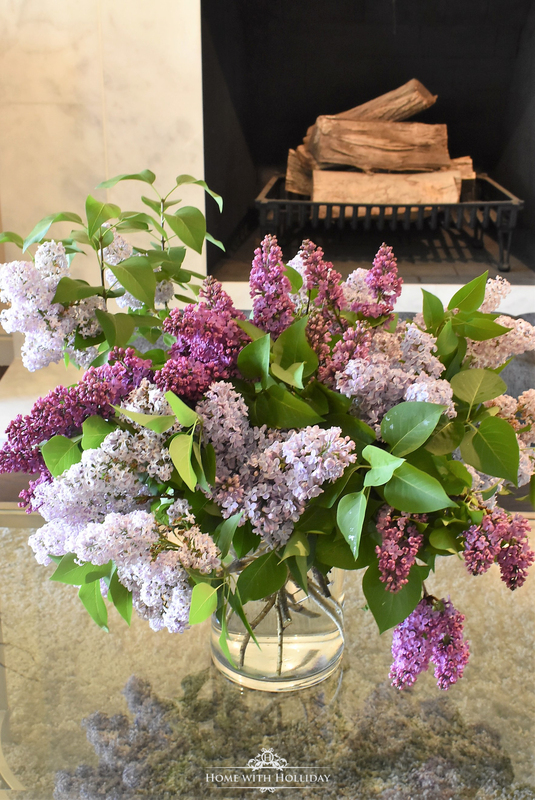 Although you’ll be losing some flowers for the current year, pruning overgrown lilacs is easiest early in the spring, before the branches leaf out. You can really see into the shrub and there is easier access to the base of the stems. After pruning your overgrown lilac by 1/3 for 3 years, the new shoots should be the bulk of the plant, the plant should begin to bloom all over and you can do simple maintenance pruning from then on. Now, onto the best part. Because lilacs are so fragrant and beautiful, there are so many ways to enjoy them. Create floral arrangements! Lilacs are literally one of the easiest flowers to arrange because they already come with their greenery. No need to add more. They are the type of flower that you can just cut and plop them in a vase, with or without the leaves! Oh, and the fragrance just takes over!! Decorate a cake or platter with them. I have had a passion for lilacs for most of my life. In fact, my entire wedding cake was covered with heaping mounds of lilacs. They are actually edible! We didn’t eat them, but they looked gorgeous on my cake. How gorgeous is this one by Twigg Studios in England?! I also like adding them to my platters when doing early summer entertaining. Dry or press them. Hanging dried lilacs in areas of your home is a lovely way to use them. You can also press them (between two pieces of wax paper) to use for a variety of craft projects. Use them to scent your homemade projects…like soaps, lotions or candles. It would also be quite decadent to sprinkle fresh ones into your bath. They actually have medicinal benefits and provide an essential oil. Bonus! Hopefully, this post was helpful for pruning and enjoying lilacs and find great ways to enjoy them. For more inspirations, check out my Pinterest page featuring gardens and gardening tips. I hope you all had a beautiful Mother’s Day! For even more inspiration, you can go to my Pinterest page for thousands of pins on 50+ topics! Please consider subscribing to my blog so you can recieve instant email notifications for upcoming posts. This post contains some affiliate links to help keep this blog up and running. I only include affiliate links that are pertinent to my topics and designs as well as links that could be helpful. I have attempted to subscribe to your blog but I receive an “error with subscribing” message each time. Just wanted to let you know, I will try again another time! Cheryl, thank you so much for letting me know. I will look into it right away with my website host. I did see one new subscriber come in earlier this morning, so I don’t know what is happening. I am so grateful you stopped by and want to subscribe. Please try again!! Just lovely, Holly! I would love to have lilacs in my area! Thanks for sharing the tips, too! Oh how I wish we could grow lilacs in Texas! We recently visited northern California and the lilacs there were mesmerizing. I do not want to miss the latest news. Sign me up for the newsletter!